Philadelphia Eagles head coach Doug Pederson answers questions following his team's loss to the New York Giants. Prior to their loss to the New York Giants, the Philadelphia Eagles had been the best team in the NFL at converting on fourth down. They were a perfect five-for-five in those situations. But that all changed on Sunday. And rookie head coach Doug Pederson's decisions to twice go for it on fourth down during the first half -- instead of sending out Caleb Sturgis, who had made 18 straight, and settling for three points -- played a big role in his team's 28-23 loss. In all, the Eagles had nine possessions in which they got the ball inside the Giants 25-yard line. Nine. All within field goal range. On four of those possessions, including their final one of the game, the Birds failed to score a single point. 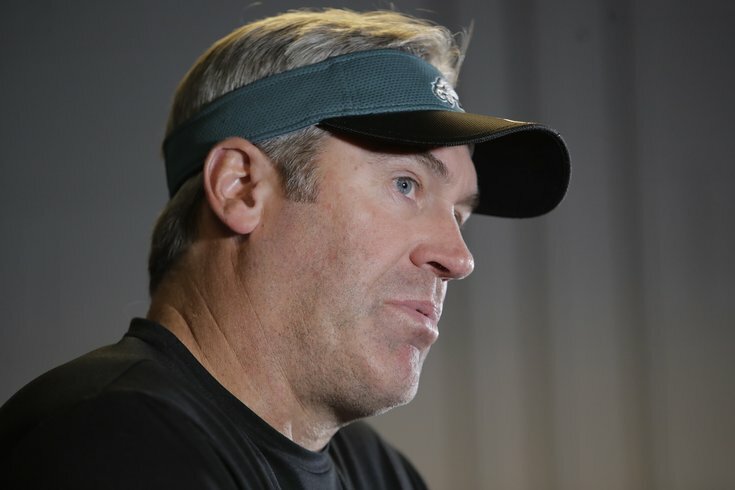 After the game, Pederson was grilled about two ill-fated attempts in particular. And to his credit, he put the blame on himself. “This is my job. This is the National Football League," Pederson said. "And I trust in our team; I trust in our guys; I trust in that locker room right now. And they’re hurting. I’m hurting. There’s a fine line between being kind of crazy, borderline crazy, and doing the right thing. The first failed attempt came on the opening play of the second quarter, meaning Pederson and his assistants had plenty of time to think it over. It was 4th and 2 from the Giants' 23-yard line, making it a 40-yard attempt, well within Sturgis' range. Instead, Pederson called a read-option play that never really stood a chance. Carson Wentz decided to keep the ball and took off to his left, only to be met by a trio of unblocked Giants defenders and taken down for a four-yard loss. What could've been a 14-6 lead for the Giants remained at 14-3. There's a good chance that's one of the plays Pederson wants back. The Birds would bounce back, however. On their next offensive drive, after forcing the Giants to go three-and-out, Ryan Mathews scored from eight yards out to make it a 14-10 game. But the Giants had an answer, scoring a touchdown of their own to go back up 11 points with under 10 minutes left in the first half. Then, after trading three-and-outs, Darren Sproles nearly took a punt to the house but was forced out of bounds inside the red zone. On 3rd and 10, Wentz hit Jordan Matthews for nine yards, setting up a 4th and 1 from the Giants' six. Again, Pederson opted to go for it instead of taking the field goal. And while the play wasn't quite as bad – at least they didn't go backward this time – the result was essentially the same. Sproles came up short of the marker on a handoff up the middle. And the Giants took over. According to Pederson, part of the reason he was so aggressive, likely to a fault, was because of the hole his team dug itself into early in the game. Each of their first two possessions ended with Wentz throwing an interception. “It’s a momentum thing," he said when pressed about his decision-making process. "I get what you’re saying. Listen, it’s an opportunity for us to score seven points over three. I truly believe in our defense and our special teams and they showed up today and made some plays in those two phases of the game. And he was right to trust his defense. For the second time in a row, it forced the Giants to go three-and-out following a failed fourth-down conversion. But when the Eagles found themselves within striking distance the next time, with just over a minute left in the first half, the decision was a little bit easier for Pederson. It was 4th and 10 from the 22, so he brought Caleb Sturgis out to get the three points before heading into the locker room. Clearly, that's the correct call. Right? As for Pederson, the fact that his team failed to convert twice in the first half didn't affect his aggressive style in the second half. With six minutes left to go and the Eagles down 28-20, he decided to go for it on 4th and 9 from the Giants' 46 rather than punt and rely on his defense – despite the fact that the Eagles didn't have any luck in much more manageable fourth down situations. This time they relied on Wentz's arm instead of his legs. He hit Matthews for 25 yards, one of nine passing plays of 20 or more yards, for a first down. And although the Eagles converted, they ultimately settled for a field goal, their final points of the game. So there's no reason to expect Pederson to suddenly become sheepish on fourth down. “I think I’ll stay aggressive. I think I have to," he said. "I think, again, there’s opportunities there to be had and there’s plays to be made. And these are all part of our growth process on offense. Rookie quarterback, young receivers, veteran offensive line. So at the same time, we’re trying to build this thing. We’re trying to do it right. And by putting them in these situations, they’re going to be better for this. "They’re going to be better down the stretch — somewhere it’s going to pay off for us, it’s going to pay off for all of us. So I’m going to continue being as aggressive as I can and send a message to our football team that I trust them." He better hope that's true, because in the last six weeks, we've seen a 3-0 team that was one of the hottest in football turn into a 4-4 team that has been banished to the basement of the division it once led. It's likely where you expected this team to be when it reached the season's midway point, but after the way the Eagles played early on, those expectations suddenly changed. And that's what makes these one-possession losses – all four of their losses have come on the road and been decided by seven points or fewer – that much tougher to swallow. “Well, right now the feeling is very disappointed," Pederson said when asked to assess the state of his team through its first eight games. "We feel like we’ve had an opportunity in a couple of these games to pull one out. It’s still a lot of season left, obviously. I feel like we’re learning. We’re kind of working through a lot of things on offensive and we’re learning how to execute and finish and do all the things we need to do to win these games. They had better, unless they want to find out first hand how ugly things can get when the Birds fall below .500 -- especially after a 3-0 start.